The Aamir Khan, Amitabh Bachchan starrer collected Rs 2.60 crore on Thursday, the lowest day till now. 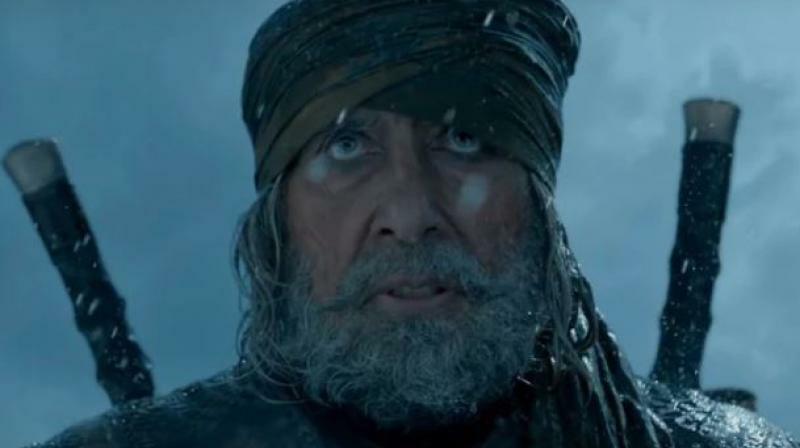 Amitabh Bachchan in a still from Thugs Of Hindostan. Mumbai: Amitabh Bachchan and Aamir Khan starrer Diwali release Thugs of Hindostan entered the 100 crore club but with a major downfall. The YRF film received severe backlash from the critics and the word-of-mouth by the audience is also mostly negative. According to noted trade analyst Taran Adarsh, Thugs Of Hindostan has collected Rs 2.60 crore on Thursday, the lowest day till now. The film is at a close total of Rs 134.95 crore including its extended four day weekend (Diwali holiday). The earning of the Hindi version is as follows: "#ThugsOfHindostan - #Hindi: Thu 50.75 cr, Fri 28.25 cr, Sat 22.75 cr, Sun 17.25 cr, Mon 5.50 cr, Tue 4.35 cr, Wed 3.50 cr, Thu 2.60 cr. Total: ₹ 134.95 cr." Adarsh tweeted. #ThugsOfHindostan is a DEBACLE... Did 37.61% of its *extended Week 1 biz* on Day 1 itself, while the remainder 62.39% was done from Day 2 to Day 8 [seven days]... Weekend 2 will give an idea of its *lifetime biz*, but the *Hindi version* will fold up around ₹ 150 cr [+/-]. Bankrolled by YRF, Thugs of Hindostan is helmed by Vijay Krishna Acharya who previously directed Aamir's 'Dhoom 3'. Also starring Katrina Kaif and Fatima Sana Shaikh in pivotal roles, the film was released on November 8, 2018.